You either never get this problem or you get it so often that it's extremely irritating. If your iPhone keeps switching back to 4G cell when you know you're on a Wi-Fi network, this is what you need to do. Maybe you're lucky or maybe you have such a good cell signal everywhere that you've not noticed. 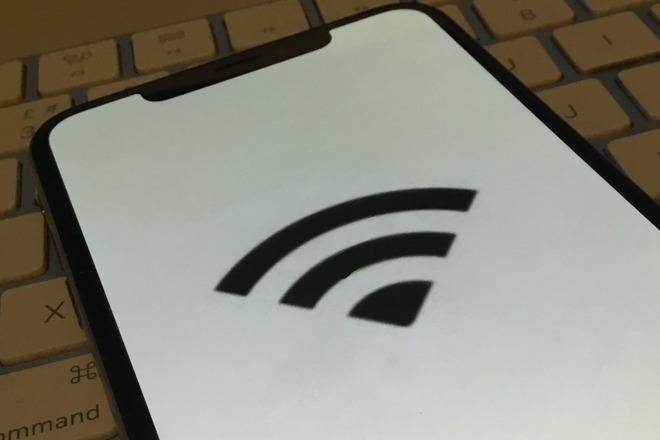 For some reason, though, iPhones under iOS 12 can be prone to dropping their connection to a Wi-Fi network. There's no obvious or reproducible cause that we can find and it's not even absolutely certain whether the problem is at the iPhone's end or the router's one. When you find that your iPad is unshakeably on that network, though, you have to suspect your iPhone. Even then, you could ignore it. Perhaps you have a fantastic cell signal and also a brilliantly cheap deal from your carrier. Whatever causes this disconnection, sometimes you just have to rejoin the network. That's already enough of a pain but we've had the iPhone then say we've entered the wrong password when we haven't. Or if it accepts the password, it sometimes reports that it can't join the network. No reason, it just can't. If that isn't enough to make you grind teeth, try asking your HomePod to phone somebody for you. If your iPhone has dropped its network connection, you'll get Siri telling you off. "Before I can help with personal requests, " it says, "the iOS device associated with this HomePod needs to be on the same Wi-Fi network." What's more, sometimes -- just sometimes -- the HomePod will immediately repeat that entire message like you need things loudly spelled out. There's nothing you can do at the HomePod to stop that repeat or to fix the issue but there is one thing that we've found does solve the problem. It boils down to making your iPhone completely forget all of its network connections. You could, instead, try going to Settings , Wi-FI and then tapping the i button next to your network. When you tap that, you go to a new page that has Forget This Network at the top. You could tap that and your iPhone will drop the connection, erase the password and not try to automatically join it again. You'd then choose this network, enter its password and carry on. We did find that this seemed to help but it wasn't a permanent solution. Before you do this, understand that a misplaced tap or two will reset your whole iPhone and wipe out everything. What we're doing will solely reset the network connections but even doing that will restart your iPhone. When that screen goes black on you, you will have a moment's gulp until the Apple logo appears. To do this, go to Settings, and this time choose General. Scroll down to Reset and tap that. You'll get a new section with three groups of options: tap on the middle one, Reset Network Settings. You'll be asked to enter your passcode -- neither Touch ID nor Face ID is enough here -- and then you'll get a warning with an option to Reset Network Settings shown in red. It takes a while for the iPhone to reset its networks and then restart. When it has, though, you'll have to re-establish those network connections. Go back to Settings one more time and choose Wi-Fi. Pick the right network that appears and enter its password. Thereafter, your iPhone should have no more problems dropping the connection. We'd like to have to not deal with this. We'd also like to be able to say why this works, or to be given a better understanding from a dialog box in iOS why the connection ever fails but we can't, and Apple in it's "infinite wisdom" has decided to not bless us with this information. What we can say is we haven't heard that wretched HomePod error phrase in a week now. I have the opposite problem. When I am away from home the iPhone connects to some WiFi node I used in the past which would normally be great but for some reason that node isn’t actually transferring data. So I have to disconnect from WiFi and force cellular. In your case, you should do the forget this network option. Question...is there anyway to delete/forget or block wifi networks that are within range of my device that I never connect to, ie: neighbors, businesses, etc.? I think it is important to tell people that "Reset Network Settings" causes your iPhone to forget every WIFI password for every WIFI network you've been on. That could be an issue for some people. I did a "Reset Network Settings" by recommendation from some article to fix an issue and realized later I lost all my saved WIFI networks. I would have rather lived with the issue I was trying to fix than to lose my history of saved WIFI networks and passwords. I used to always have to do the same thing specifically with AT&T WiFi hotspots. It was frustrating. AT&T made a big deal about how they have all of these free WiFi hotspots available to their customers, but I never, I mean NEVER, had any success transferring any data when connected to one. I would just sit and watch the "wait" animation spin for like 30-60 seconds, then give up and turn WiFi off. Try again using cellular and trasmit within a second or two. IMHO, AT&T WiFi hotspots are totally useless, at least for me, because they NEVER, EVER work. I had this issue in 2011 on my 3GS ,which I did not have on my iPhone 2G. I did the forget network ,and it got fixed. I believe this is mostly a WiFi DHCP lease issue.My network at home has the lease set to 30 days now ,since we hardly bring any random new devices on our network. The best way to avoid resetting all of your Wi-Fi passwords for your other devices when you reset the network on your iPhone is to turn off iCloud Keychain before hand. So the process would be: Turn off iCloud Keychain>Reset Network settings on your phone>Turn on iCloud Keychain on your phone. This should result in all of your Wi-Fi passwords being re-downloaded to your phone after the reset. Yes, there is. You need to do this on the Mac by deleting the networks you don't need in System Preferences > Network > Wi-Fi > Advanced > Wi-Fi. These networks will be removed from the iPhone's list of known networks (which you cannot see on the iPhone, but the list is there nonetheless). Your Mac's list of known Wi-Fi network will sync with your iPhone's list via iCloud. Not quite the issue Ive had recently, but my iPhone X, while streaming itunes content on WIFI, will lock up, typically after 2-4 minutes of watching. I have to put the phone into airplane mode and force close the TV app, then reconnect to wifi, or, just tell siri to turn off wifi and then tell siri to play the movie / show. This doesn’t happen on any of our ipads or AppleTV that are streaming Netflix or iTunes all day long. Nor my wife’s iPhone 7, just my X. Thanks for answering. I'm not sure that this is exactly what I mean though. I checked your method and I only see networks that I have previously connected to. What I was asking is, is there is a way to disregard or 'make invisible', networks that I see all the time, that I will never connect to, like my neighbors. Thanks again. For some reason, though, iPhones under iOS 12 can be prone to dropping their connection to a Wi-Fi network. I don't think this problem is just with iOS 12 and iPhones; I've had it plenty of times at work with iPads and iPhones on iOS 10 and 11, all using an enterprise WPA2 network. To make matters worse, to fix a connection problem sometimes I have to key in our 35+ character password [why network guys, why? ], which consists of totally random numbers, lowercase, uppercase, and symbols -- and for some reason iOS doesn't let it work with a copy and paste. It has to be hand keyed -- anyone know why? I often end up running my phone as a hotspot because that is so much easer to key in. Wow, @dedgecko , I am glad you are writing about your experience. I have the EXACT same issue. At first, I thought it was the YouTube app because I was experiencing this issue with the app. But it turns out I'm also having the issue with Netflix app and in fact it doesn't seem app dependent (or not caused by an app). What I end up doing is also turning off airplane mode for a while, then turning back on and I can continue watching my YouTube clip or Netflix until the next time the WiFi hangs up again. I have tried Reset Network setting, turning on and off iCloud keychain, etc. and none of that resolves the issue consistent. I'm using an iPhone XS that exhibits this problem. My previous phone was an iPhone 6. I had that phone for about 3 years and it did not exhibit those problems until say, if memory serves me correctly, the last 6 months (recently). I chalked it up to the phone being old and maybe some hardware was going wonky. I upgraded to an iPhone XS for that reason and other reasons, but the problem is still there. Does anyone know how to resolve this issue? The most extreme thing I can try is to entirely erase the iPhone XS and not do a restore from back up but to manually add apps one at a time. That way, I can be sure that an issue with the backup isn't causing problems when restored to the iPhone. I don't want to go that route, of course, because this is a pain. There won't be any data loss for me since everything is in the cloud and can be redownloaded. It's just administratively very burdensome and time consuming to do it like this. No. Why would you want to? This is where the Wi-Fi password sharing feature between known contacts should come in handy. I have a different WiFi problem. When I leave home, for example, my WiFi will try to hang on until I'm a block or two away, even though no data is getting through. It just doesn't switch to the cell network in a timely manner. And when I get back near home, it will do the same thing in reverse, connecting and trying to use the home network before it can actually transfer any data. In either case, my network connection can be useless for several minutes. That’s the problem with “walled gardens”: you’re at the mercy at vendor. Things that could be easy fixes require brute force approaches like nuking all settings or worse reinstalling the entire OS and all apps. This is a dumb take, regarding troubleshooting steps that are largely the same on Windows and Android. Do you have the source code for Windows 10 to fix similar problems on it? Or do you have the knowledge to debug Linux or Android code and TCPIP networking and recompile to fix the root of the same sort of troubles like a vendor can? Settings< WiFi < Turn off “ Ask to Join Networks “. 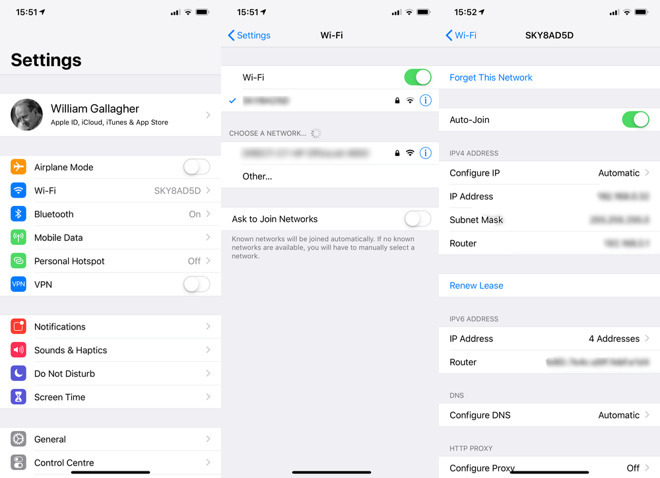 ios devices should automatically connect to the strongest network in range (it can connect to) not ‘a’ network, and should switch to the strongest network wile connected.